A doe’s ear twitched. She shook her head, then dropped it to the trail. Her shiny black nose sniffed side to side. With a start, her head rose up. She looked to the south, then took two steps forward. Her tail stuck straight back, not up and not down. The morning’s fluky wind ruffled white tail hairs, but her tail never flicked, as I thought it might. At the first glimpse of that doe’s ear, I grounded a knee behind a scrawny red cedar. The tree was a pitiful specimen, but it broke up my shape and provided sufficient cover for a humble woodsman to watch unnoticed. The ground was frozen, but without snow. The air smelled clean and crisp, cold enough to make my nose drip. November was almost spent, in the Year of our Lord, 1793. In all, four deer emerged on that trail, just beyond the reach of “Old Turkey Feathers,” my Northwest gun. A fresh buck hung at the trading post, and I hoped to find another. Besides, the ribs showed on all four of the deer before me; the smaller two more than the older pair. With little thought, I chose to seek out others and waited for these to pass. In due time, I carefully got to my feet, but stayed still. I looked about, not wishing to become the object of a British ranger’s campfire tales, or some other hostile’s trophy. Tree-to-tree, I stalked to the north, keeping below the ridge crest and a bit to the west. The still-hunt progressed with more time expended watching and looking than moving. A hundred paces to the north another doe emerged, much as the first one had. Again a leather-clad knee rested on the frozen leaves. When the doe looked away, I brought down the other knee and rested back on my haunches. A few moments later that spring’s spotless fawn appeared. The two turned south and plodded along on the ridge-crest trail. Much to my relief, at about forty paces the old doe turned west. The pair crossed in front of me, and when they reached the bottom of the hill they struck off to the northwest on the earthen trail that paralleled a swampy thicket. A distant muzzle blast brought new concerns. Instead of standing, I gazed about with extreme care. I stayed back on my haunches until I knew I was alone in the forest, save for the blue jays and an occasional crow that winged over in total silence. I rolled up off my tingling legs, took one step and leaned against a modest maple trunk. Minutes ticked away. A curious blue jay swooped close and perched within the boughs of a tall red cedar tree. It cocked its head, but never uttered a sound. I advanced with a slow step, then paused. Unperturbed, the blue jay flew off before my next footfall. We were, after all, both tenants of the forest. Most people like the security a formal definition offers. Traditional black powder hunters are no different. When defining this glorious pastime, I emphasize that I pursue wild game to provide food for the table. A driving force is an almost addictive desire to re-create the hunting conditions of a bygone era and an unquenchable curiosity to experience what it was really like to live, survive and hunt in the Old Northwest Territory—in my case, in the last decade of the 18th century. My definition usually includes a reference to the importance of solid historical research and primary-source documentation. I jabber on about fine-tuning forgotten outdoor skills and learning by hands-on participation in the wilderness classroom. And somewhere in that mix I throw in a statement about the necessity for creating a proper mindset or mental attitude that guides and shapes all aspects of any given pursuit. It should be no surprise that the vast majority of topics addressed in my scribblings touch on the intricacies of nurturing an appropriate way of approaching and thinking about the past. Further, I suppose it could be argued that all of them do. Sometimes the connection is subtle and at other times bold, perhaps to the point of being aggressive. If a meaningful time-traveling simulation is to take place, one that results in the potential to experience pristine 18th-century moments, I believe a proper mental attitude must be present first. And to add a caveat, each traditional hunter must realize that this guiding mindset is contingent upon one’s chosen time period, station in life and geographical area. Thus the backstory of every persona is different and requires a different and unique mindset to complete a truthful characterization. On the one hand, a living historian’s mind can contain any number of incidences or exploits from the persona’s past. On the other, one’s mind must make a concerted effort to push over the cliff of conscious awareness any and all knowledge of “future occurrences”—anything that happenings after the historical present. 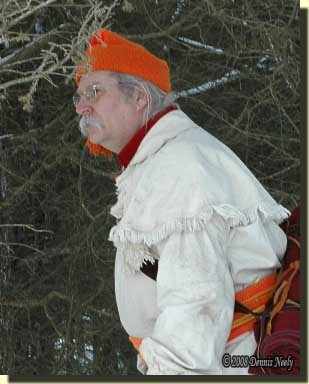 So often, as devoted living historians, traditional hunters get caught up in the mechanics of re-creating a period-correct persona and overlook the nuances of a hunter hero’s daily thought processes. When my writings incorporate “a distant muzzle blast,” questions arise as to why I mention a 21st-century sound in an 18th-century sojourn. Within the historical context of my time travels that muffled, echoing “BOOM!” is just as real as a blue jay or crow not hollering, geese ke-honking on the River Raisin or the snort of a disturbed doe. In truth it is the sound of a modern shotgun discharging, but my mind pushes that reality over the cliff and into oblivion, choosing instead to increase my heart rate and stir up concern that a British ranger or other hostile presence is not that far off. Not too long ago I wrote about honing a woodland skill in “Trees Don’t Grow Bigger…” That missive dealt with a common-sense secret: “Don’t look for the whole deer, look for parts…” The question that I posed: “When was the last time a thirty-point buck stepped out into a clearing, stopped at twenty paces…” drew quite a few comments. But when dealing with creating a proper 1793 mindset that question needs to be rephrased to: “When was the last time a British ranger or Shawnee warrior stepped out into a clearing, stopped at twenty paces, turned broadside and looked away while you cocked your firelock, tried to calm pounding arteries and keep the front sight on his chest?” Just as for the white-tailed deer, the wild turkeys or the fox squirrels, that type of behavior is not conducive to long-term survival. On that particular November deer hunt, as with most of my adventures, there was an evasiveness woven into the fabric of my every action. I moved slow and with deliberate forethought. I knelt to minimize my human shape and used all available cover. That day’s course followed a doe trail that was below the ridge crest and to one side. My buffalo-hide moccasins whispered on the dirt path, even with frosty leaves scattered about. Unlike the old doe and her fawn, I kept to the shadows and avoided stepping out into the open. By nurturing a proper mental attitude, my 18th-century being was already in a defensive mode before the distant musket’s report. But that mindset, repeated over and over, day in and day out, cautioned me against standing and making my presence known. Instead, I sat on my haunches and gazed about, making sure there was no present danger in my 1793 world. Nurture a proper mental attitude, be safe and may God bless you. 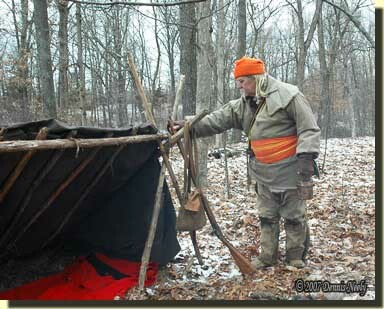 This entry was posted in Deer Hunts, Scenarios and tagged Dennis Neely, historical trekking, Mountain Man, North West trade gun, Northwest trade gun, trade gun, traditional black powder, traditional black powder hunting, traditional blackpowder, traditional blackpowder hunting, Traditional camping, Traditional Woodsman. Bookmark the permalink. This hobby is so much fun! It is interesting how everyone’s persona is different and how the perspectives change from person to person. And no, “you just can’t take the chance,” especially with a French/Shawnee half breed skulking about the forest.